This is a must have book! Collectors and dealers had to wait a long time for a modern reference work on the history and collection of Confederate bonds, but this book was certainly worth the wait. Written by the late Dr. Douglas B. Ball, Ph. D., this book provides a comprehensive listing of all of the main types of bonds issued by the Confederacy, as well as the numerous small variations within each major type. Following a brief introduction, short biographies are provided for the different printers that were contracted by the Confederacy to produce the bonds, and also for those individuals whose job it was to sign them. Descriptive paragraphs dealing with such topics as bond size, paper, and coupons are included. A rarity scale, with the estimated number of extant specimens for each level listed, concludes the opening portion of the book. The main body of this work, over 200 pages, is devoted to the history and attribution of the many types of bonds issued. The bonds are grouped by the Confederate Congressional act that they were issued under, with an historical perspective of each act presented at the beginning of the representative bonds. Each issue is described in detail, including the number issued, the date of issue, the printer, the type of paper used, and the signers. Black and white illustrations are presented for each major type, with many close-ups used to highlight the differences of the various sub-types. Of importance to collectors, a rarity number has been assigned to each bond, and values are given in two states of preservation. A Criswell-Ball cross index completes this work, allowing the collector who has used the Criswell scale to now list his pieces with the updated Ball system. A necessary reference for the collector, and an interesting read for the individual who wishes to learn more about Confederate finances. 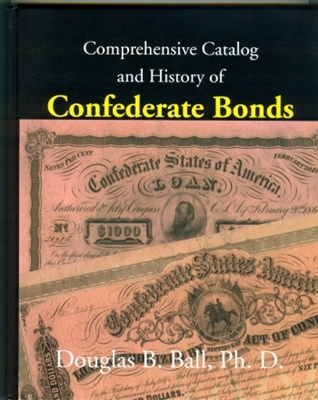 Ball, Douglas B., Ph.D. Comprehensive Catalog and History of Confederate Bonds. Port Clinton: BNR Press, 1998.